Fall is on the way and with the return of fall comes the return to a more structured, scheduled evening. The kids get home from school, we do homework, I make dinner, we do bath time and then it is off to bed for the kids! It makes for a very busy evening and I crave easy to make dinner recipes that are done in under 30 minutes. 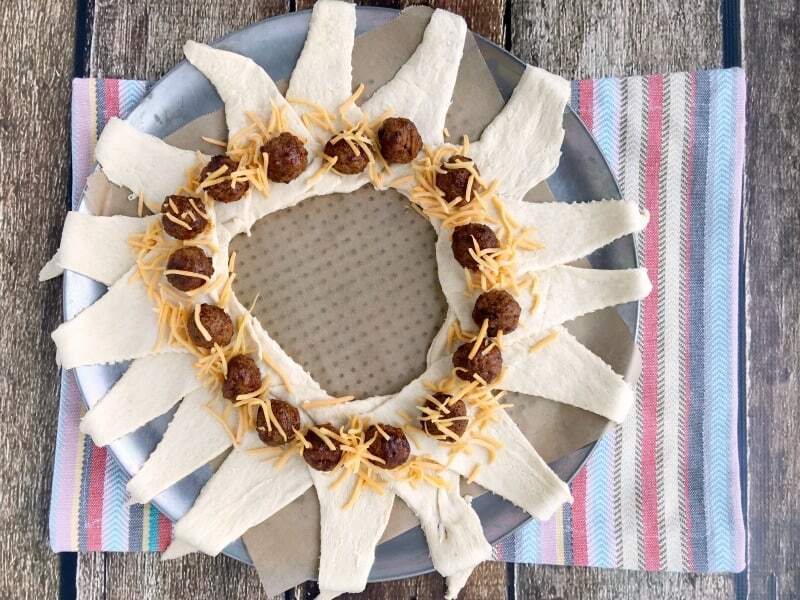 This meatball taco ring recipe fits the bill and it’s also a favorite in our house (even the kids love it!). 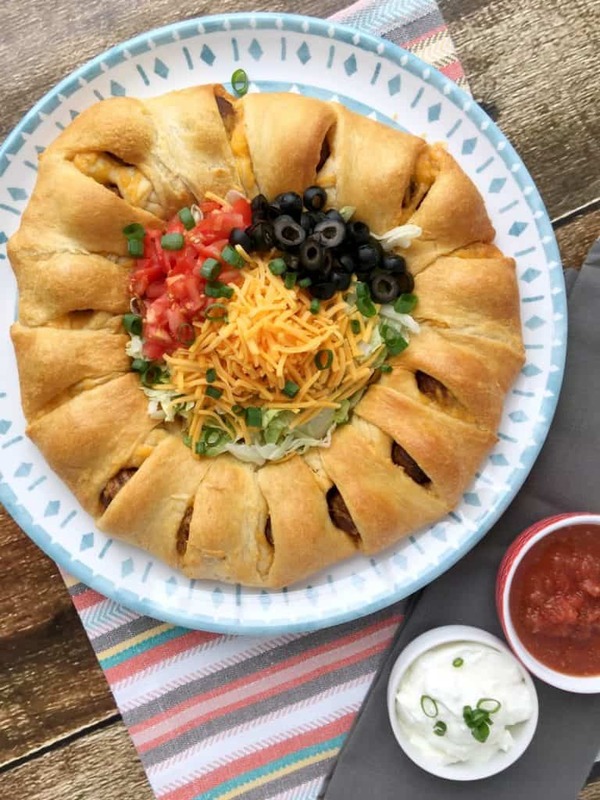 This meatball taco ring recipe is the perfect kid-friendly recipe because it combines two kid favorites, meatballs and tacos! How can you go wrong? You can’t! 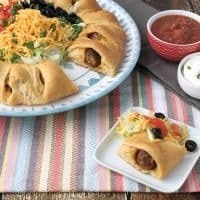 To make this yummy meatball taco ring recipe for your next Mexican night you’ll need a 16 original meatballs, 2/3 cup water, 2 tablespoons taco seasoning, 2 cups shredded cheddar cheese, 2 tubes crescent rolls, shredded lettuce, tomato, green onions, sliced black olives, jalapeno peppers (optional), sour cream or greek yogurt and salsa. Begin by combining water, taco seasoning and meatballs in a sautee pan. 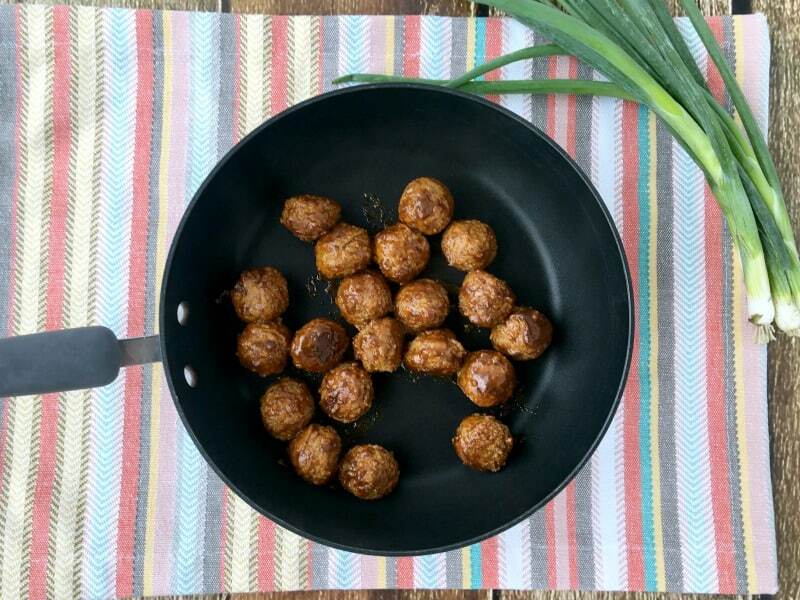 Cook over medium heat, stirring often, for 10-15 minutes until meatballs are warmed. While meatballs are cooking preheat your oven to 375 degrees F. Place a piece of parchment paper on your pizza pan or grease it. 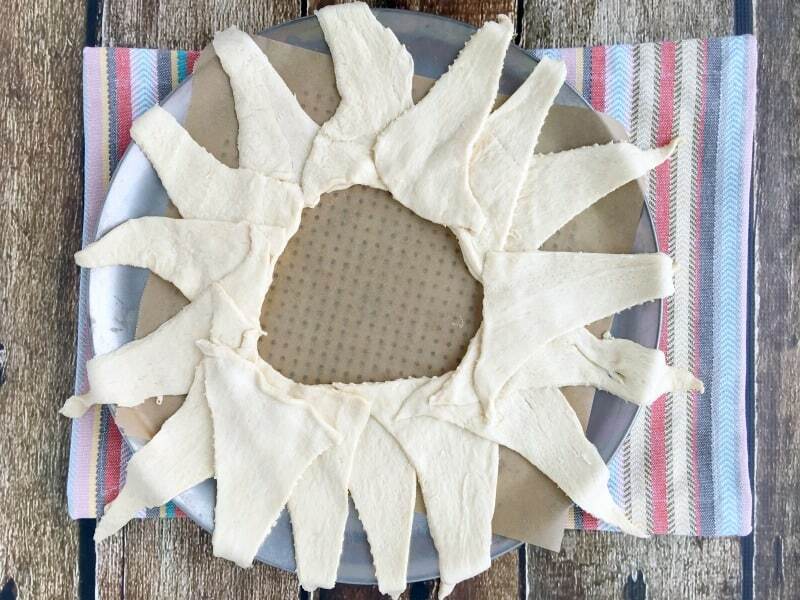 Arrange the crescent rolls in a circular pattern, with the wide edges overlapping and the pointy ends facing out. It should look like a wreath. Place a meatball on each crescent roll. Now sprinkle with 1 cup of shredded cheddar cheese, over the meatballs. Fold the pointed end of the crescent roll over the meatball and tuck it under the wide end of the crescent roll. Press it to hold in place if necessary. It is okay if the meatball is showing through, it should be. Continue folding over the pointed edges as you make your way around the circle. Continue until all ends are folded over and tucked under the wide end. 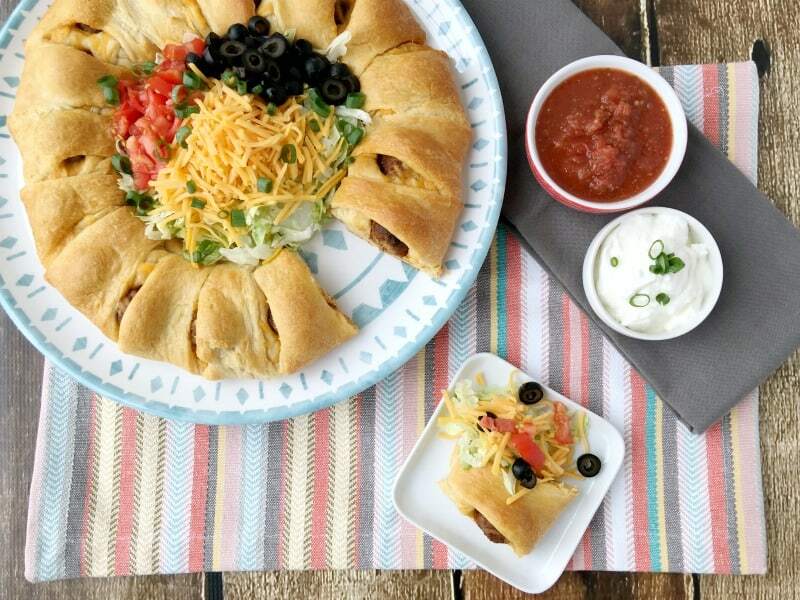 Transfer your meatball taco ring to a serving platter. 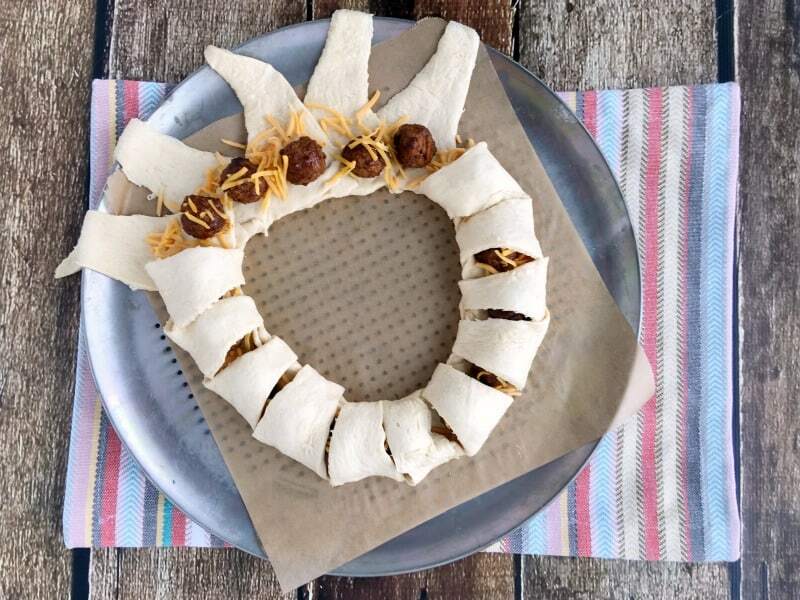 If you used parchment paper then the meatball taco ring will simply slide right off the pizza pan and onto the platter. 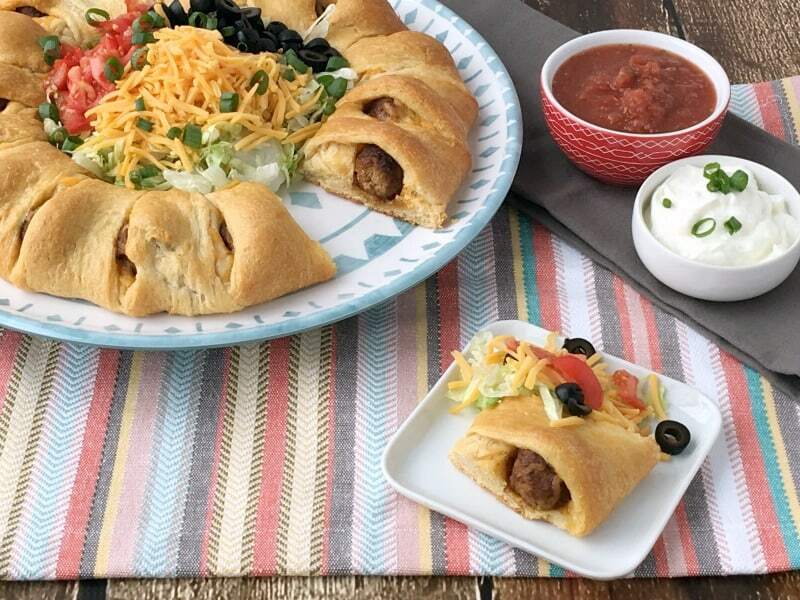 Fill the center of your meatball taco ring with lettuce, tomato, onions, olives, jalapenos, and remaining cheese. Serve salsa and sour cream or plain greek yogurt on the side. 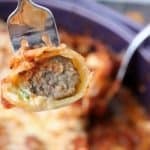 This is best served warm and will serve up 16 servings of one meatball crescent each. 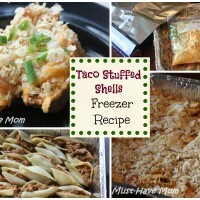 This is great for a party appetizer or a meal for your family. We’ve served it both ways! 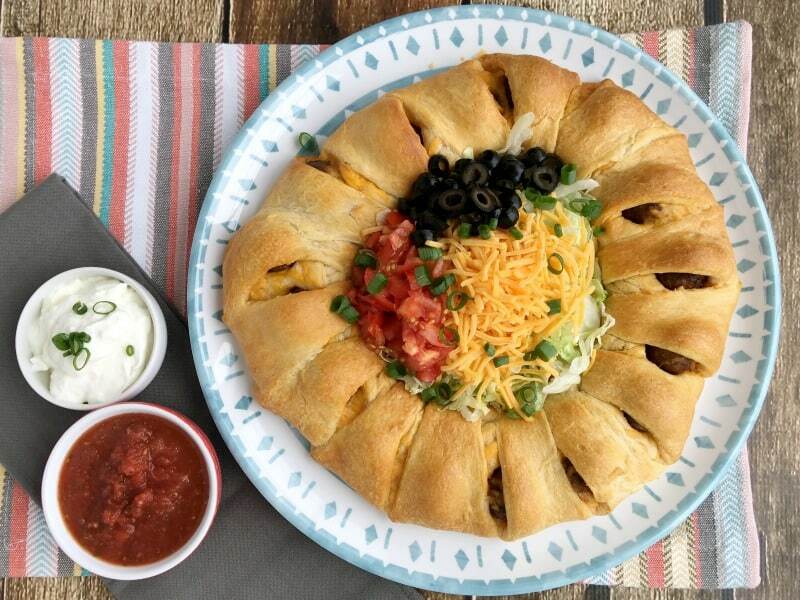 If you have picky eaters then they will love that this meatball taco ring allows each person to customize their meal. 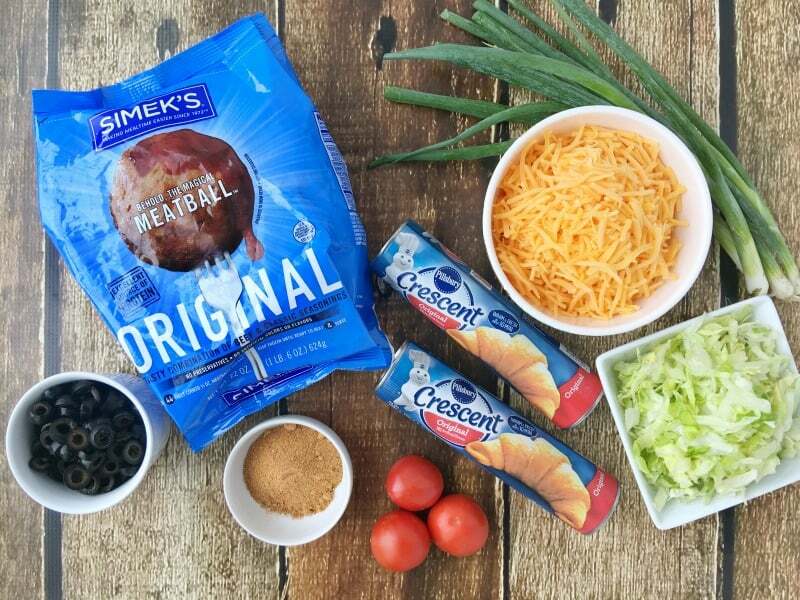 They can choose to simply take a crescent wrapped taco meatball or they can add their favorite fixings to it. Everyone gets what they like! Print off the recipe below and be sure to also pin the image below so you can easily find it later. Don’t forget to share it on Facebook so your friends can give it a try too! Easy weeknight meal or appetizer for a gathering, ready in 30 minutes and a kid-pleaser too! In a sautee pan, combine water, taco seasoning and meatballs. Cook over medium heat for 10-15 min, stirring occasionally, and stir well to combine. 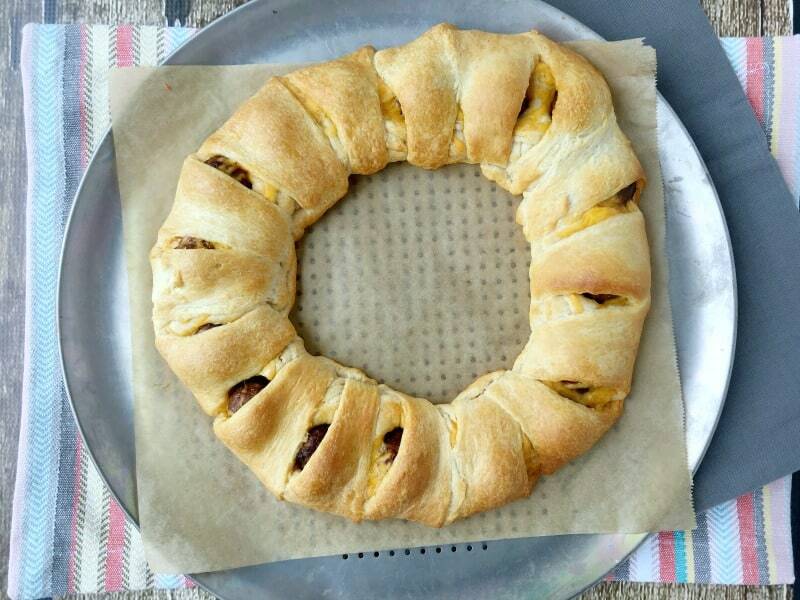 Arrange crescent rolls on a greased 15-in. pizza pan, forming a ring with pointed ends facing the outer edge of the pan and wide ends overlapping. 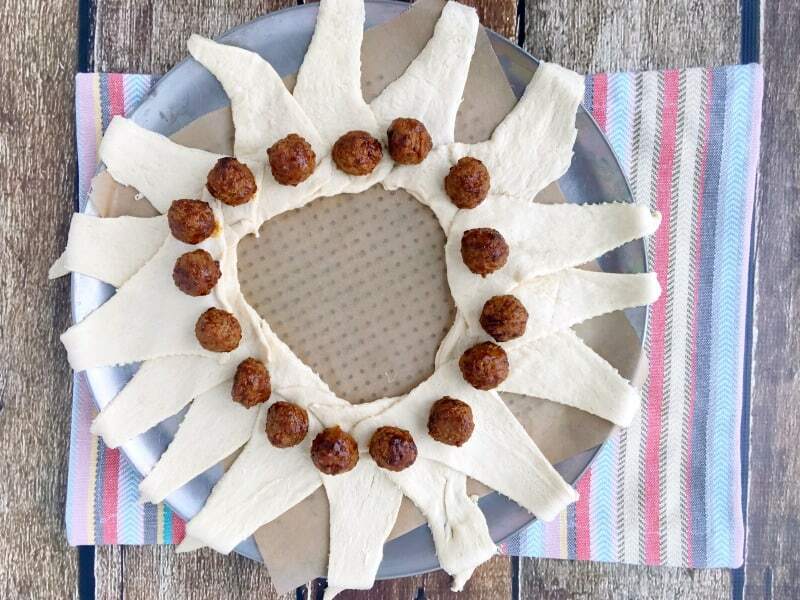 Place a meatball on each roll. Sprinkle 1 cup of cheese over meatballs. Fold point of crescent roll over meatball and tuck under wide end of roll. Repeat until all meatballs have been covered in crescent roll. Bake for 15-20 minutes or until rolls are golden brown. Transfer to a serving platter. Fill the center of the ring with lettuce, tomato, onions, olives, jalapenos, remaining cheese, and sour cream and salsa if desired. 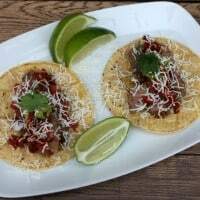 Mexican Steak Tacos with Steak Marinade Recipe! « Sunday Sweeps Giveaway Linky! 8/14/16 Edition! Thanks so much for joining us at Delicious Dishes! 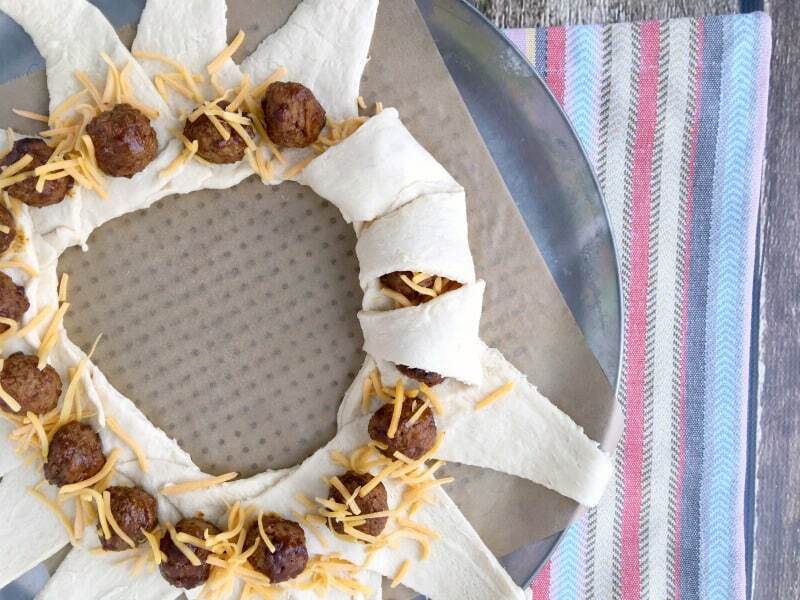 We love your Easy Meatball Taco Ring recipe and hope you’ll join us again this week! 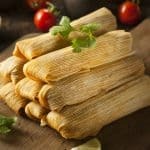 I want to make this recipe! It looks amazing and so delicious! Thanks for sharing. This looks super yummy. Using meatballs is a great idea. I would love to try this. It really is good. Give it a try and let me know what you think. This looks fun to make! I love the ingredients. Looks delicious! This is a great idea!! 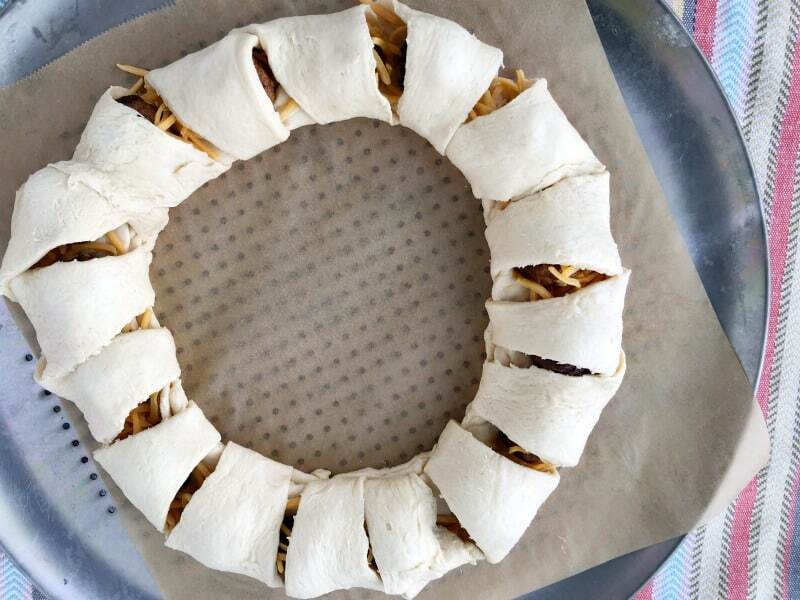 I use to make a taco ring like this. 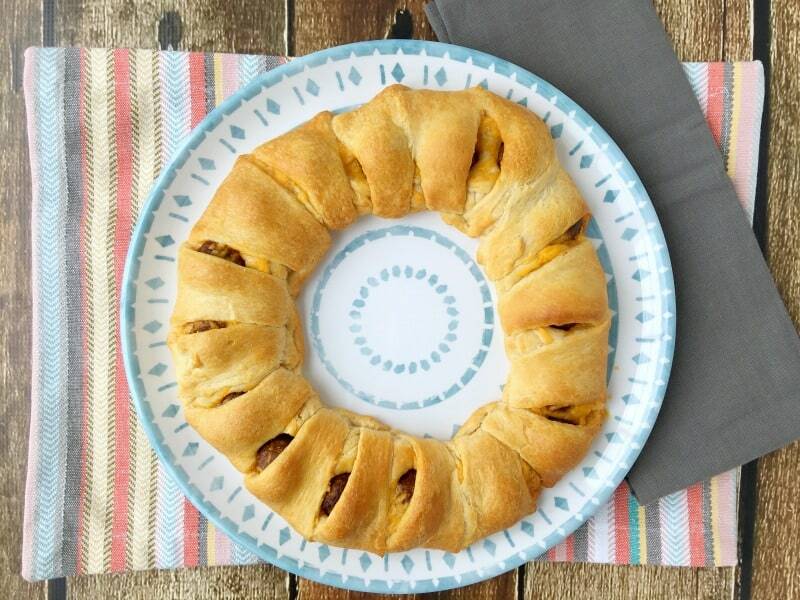 The meatball ring is a great idea & nice change from my taco ring. Can not wait to make it. This is a great idea as a party appetizer. I look forward to trying this recipe. Thank you for sharing.